Emirates Team New Zealand coach and sailor Ray Davies this week won the 2018 RC44 Championhip as tactician aboard the Monaco entry Charisma. 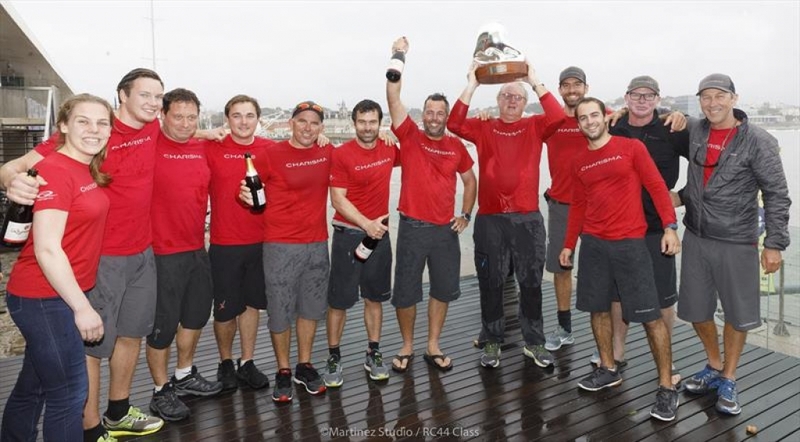 The five-event 2018 RC44 Championship ended on the 18th of November in Cascais (Portugal) where Charisma hit the jackpot, winning the RC44 Cascais Cup and claiming the victory of the overall series. The RC44 Championship Tour, launched in 2007, has established itself as a key series and has some of the world’s elite sailors on high performance one-design racing yacht. The boats are strictly identical in terms of construction, shape of hull, appendages and weight distribution so is the crew that makes the real difference. Davies has been tactician onboard with owner / driver Nico Poons all year and made a stunning come from behind victory to take both the event and the overall championship in Cascais. After a forgettable first day sitting bottom of the leader board, Charisma finished strongly with three 1sts in what turned out to be the last three races of the event before the business end of the regatta was blown out with too much wind. “It was a very satisfying victory as we came from behind winning the last three races of the season. The RC44 is a high performance monohull and is good class to keep honing your racing skills, and developing boat speed and communication skills. This can all be transferred to the America’s Cup” said Ray Davies. From Cascais Ray has flown directly to Hervey Bay in Australia to assist Glenn Ashby, Pete Burling and Blair Tuke with their A Class World Championship which concludes today.